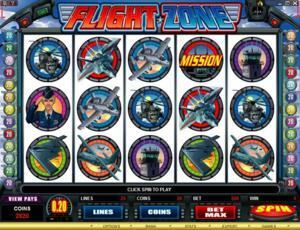 Flight Zone is an online video slot machine game from Microgaming that has been released in June 2009. This online video slot game has 5 reels and 25 pay lines. The theme of Flight Zone is inspired by the 1986 movie Top Gun. You get to take a sweet ride on some of the world’s fastest supersonic jets and get to shoot down some high-profile criminals in this action-packed online slot game, Flight Zone. Flight Zone is suitable to play for all levels of players, whether you’re only a beginner or already an expert. With an energetic soundtrack, stunning animation, realistic sound effects and generous prizes (47,600 in the main game; 95,200 in the Free Spins; 3,400 in the Mission Bonus Feature game; and 10,000 in the Gamble Feature), you will surely come back for more! Microgaming online slot games are accessible to players in 2 formats – download and no-download. Most people typically prefer to download software because they can enjoy Microgaming’s entire list of online slot games in one download only, while there are those who would like to play instantly so that they can find out if a certain slot game is fun and exciting enough to spend their precious time and real money with. Whether you like to download their software first or you prefer to play instantly without the need to download, then Microgaming surely has slot games to cater to your specific slot gaming standards. Flight Zone belongs to the download category of Microgaming slot games, which means you must download it first before you can play the game. Flight Zone features scatter wins, Stacked Wild symbols, a Flight Zone Mission Bonus Feature game, a maximum coin jackpot win of 1,000 coins per line bet, a cash jackpot of $4,000, a Gamble Feature, and a Free Spin Bonus Feature game that can award you with a 2x multiplier on all winning combinations! If you are one of those who loved the movie Top Gun and other fighter jet-related movies, then you will surely love spending some time playing at the Flight Zone online slot machine game! The quality of the graphics and sound provided by Microgaming software is without doubt excellent. They hold an impeccable track record of generating the most spectacular graphics and realistic sound effects. A lot of online slot players love Microgaming because its online slot games have smooth animation and remarkable yet non-intrusive background music and sound effects. In Flight Zone, they have really done an outstanding job of bringing together a group of awesome fighter jets and other military aircrafts in a slot machine game. The symbols are drawn in a realistic manner, and even if they are dark colored, you will still definitely play here for a long time as it does not strain or hurt your eyes. Many people liked the smooth animated programming and the realistic sound effects that come with the symbols because it makes them feel like they are smack right at the middle of the battlefield itself! The overall graphic design of Flight Zone mainly displays the black control panels in the cockpit of a fighter plane, overlooking the cloudy blue skies. The buttons and the payout table are even designed as control panel displays too to complete the effect. Other colors used include blue, red, green, pink, silver, yellow, orange, purple, white and black. Background music that you will hear when you spin the reels in the Flight Zone slot game is obviously action themed, with upbeat drumming and electric guitar sounds. When you manage to hit winning combinations with certain symbols, you get to hear appropriate sound effects. For instance, if you get a winning combination involving the Fighter Jets, you will hear the sound of their engines as they fly across the sky. There are no card deck symbols available in the Flight Zone online video slot game. The regular symbols that you will find in Flight Zone are the Pilot, Communication Officer, Fighter Jet, Stealth Bomber, Aircraft Carrier, B-52 Bomber, Air Control Tower, A-10, and Apache Helicopter. The Wild Symbol is Flight Zone symbol. The Flight Zone wild symbol acts as a substitute for all other symbols (except for the Scatter symbols) in order to you help you form winning combinations. The Flight Zone wild symbol only comes out on the 2nd, 3rd and 4th reels, and they can appear Stacked. It is entirely possible for you to get up to 3 Flight Zone wild symbols to come out on a reel in a single spin, which makes up a Flight Zone wild symbol Stack. Stacked Flight Zone wild symbols significantly increase your chances of winning by means of substituting for other symbols to help you complete winning combinations. There are 2 Scatter Symbols in the Flight Zone online slot game: the Cockpit Mission and the Guided Missile symbols. These scatter symbols are not required to appear in a line (on an enabled pay line) for you to win. • Cockpit Mission scatter symbol – Appears on the 2nd, 3rd and 4th reels only. When you get 3 Cockpit Mission scatter symbols (anywhere on the 2nd, 3rd and 4th reels) simultaneously, you will trigger the Flight Zone Mission Bonus Feature game. • Guided Missile scatter symbol – Appears on the 1st and 5th reels only. When you get 2 Guided Missile scatter symbols (anywhere on the 1st and 5th reels) simultaneously, you will trigger the Free Spin Bonus Feature game. Please take note that the Guided Missile and the Cockpit Mission scatter symbols will not give out any winnings; however, they let you enter and play their respective Bonus Feature games. If you manage to get 3 Guided Missile scatter symbols that can be found anywhere on the 1st and 5th reels at the same time, you will trigger the Free Spin Bonus Feature game. You are initially awarded 10 Free Spins wherein all winning combinations you get with these Free Spins are doubled! Please note that while in the Free Spins you manage to get 3 Cockpit Mission scatter symbols to come out on the 2nd, 3rd and 4th reels simultaneously, you will activate the Flight Zone Mission Bonus Feature game. If you manage to get another 2 Guided Missile scatter symbols to appear anywhere on the 1st and 5th reels simultaneously while playing the Free Spins, you are rewarded another set of 10 Free Spins! The extra Free Spins are included to the rest of your Free Spins. You can win an infinite amount of Free Spins in the Flight Zone Free Spin Bonus Feature game. Once the Free Spin Bonus Feature game is over, you are then automatically returned to the main Flight Zone online video slot game, and your winnings from the Free Spins are added to your main balance. If you manage to get 3 Cockpit Mission scatter symbols to appear anywhere on the 2nd, 3rd and 4th reels in a single spin, you will activate the Flight Zone Mission Bonus Feature game. There are 2 levels in the Flight Zone Mission Bonus Feature game, wherein you get to win random bonus prize amounts. The aim of the bonus game is for you to destroy “targets” (you win bonus prizes) and proceed to the next level. At the beginning of the bonus game, you are allocated 4 Guided Missiles. You are presented 10 targets which may contain Atomic Fuel plus bonus prizes, while some are decoys that only contain bonus prizes. Your mission is to utilize 3 Guided Missiles to destroy 3 targets that contain Atomic Fuel, and if you succeed, you get to advance to the next level of the bonus game. Each time you destroy an Atomic Fuel target, it is highlighted on the Mission Status Board. If you destroy a target that does not contain Atomic Fuel, you are given a consolation bonus prize, and the bonus game will end. If you manage to advance to the 2nd level of the bonus game, you have to use your remaining missile to hit a target and win an extra bonus prize. At the conclusion of the Flight Zone Mission Bonus Feature game, you get to win the combined sum of the bonus prizes you got. Please note that some targets are Collateral Damage targets. If you hit them, all the targets surrounding it are destroyed as well. You are rewarded the combined sum of the bonus prize amounts shown. You can activate the Flight Zone Mission Bonus Feature game even while playing the Free Spin Bonus Feature game; however, the Free Spin multiplier does not multiply the winnings you will win during the Flight Zone Mission Bonus Feature game. Once the Flight Zone Mission Bonus Feature game is over, you are then automatically returned to the main Flight Zone online video slot game, and your winnings from the bonus game are added to your main balance. Flight Zone has 5 reels where you may bet on 25 pay lines. The minimum bet is 0.01 and the maximum bet is 0.20 per pay line. You can wager from 1 up to 20 coins per pay line bet. Thus, the maximum bet amount is 100.00 per spin. Please take note that the amounts mentioned are in Pounds, but they will remain the same if you choose to play in US dollars, Euros, or Canadian dollars. Also, for every coin that you wager, you will enable another pay line. You will be paid out for winning combinations on enabled pay lines only. The maximum payout in the standard Flight Zone online video slot game is 1,000 coins per line bet. People who frequently play online casino games typically love to stay longer on online slot games that have an Autoplay function. Good thing that Flight Zone is equipped with one! In Microgaming online slot games, they have 2 game modes – Regular mode and Expert mode. You can have the game spin automatically for you with the Autoplay function that can be found by clicking the Expert button (if you look closely at the brown line at the bottom part of the game screen, you will see the Expert button just below the Bet Max button). After putting in your preferences, just click on the Start button, and the game will automatically spin for you while you just sit back and enjoy playing this action-packed Top Gun-themed online video slot game!